The city of Erie, Pennsylvania seen across Presque Isle Bay, Presque Isle State Park, Lake Erie. Where in the United States is Pennsylvania? Location map of Pennsylvania in the US. Pennsylvania, officially the Commonwealth of Pennsylvania, is a US state in the northern and Mid-Atlantic regions in the north east of the United States, with a 43 mi (70 km) short shoreline at Lake Erie. The Delaware River forms its eastern border with the states of New York and New Jersey, in south Pennsylvania is bordered by West Virginia, Maryland and Delaware, and to the west by Ohio. Founded in 1682 by William Penn, an English real estate entrepreneur, who gained sovereign rule of the territory with all rights and privileges (except the power to declare war). Pennsylvania was one of the 13 original colonies that abandoned the rule of the English Crown and later formed the United States. Pennsylvania ratified the U.S. Constitution on 12th December 1787; it was the second state, after Delaware, to ratify the U.S. Constitution. 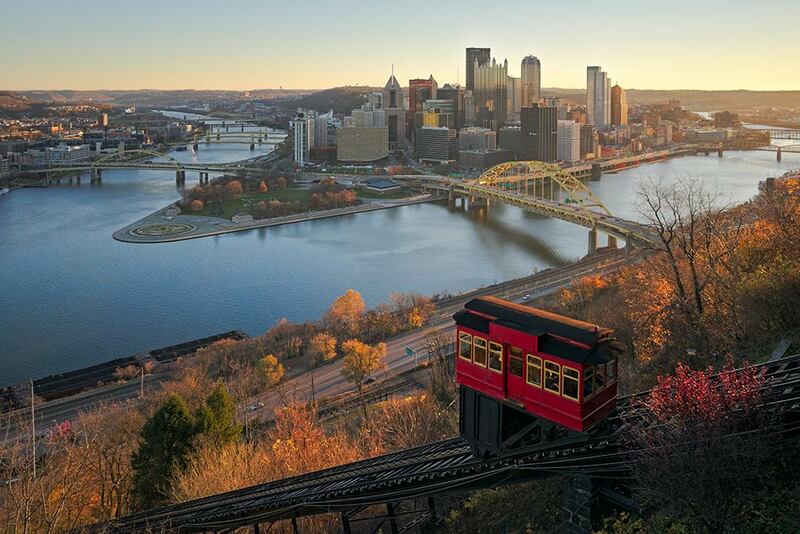 With an area of 119,279 km² (46,054 sq mi) , Pennsylvania is ranked 33 in the US list of the largest states, about one third the size of Germany. 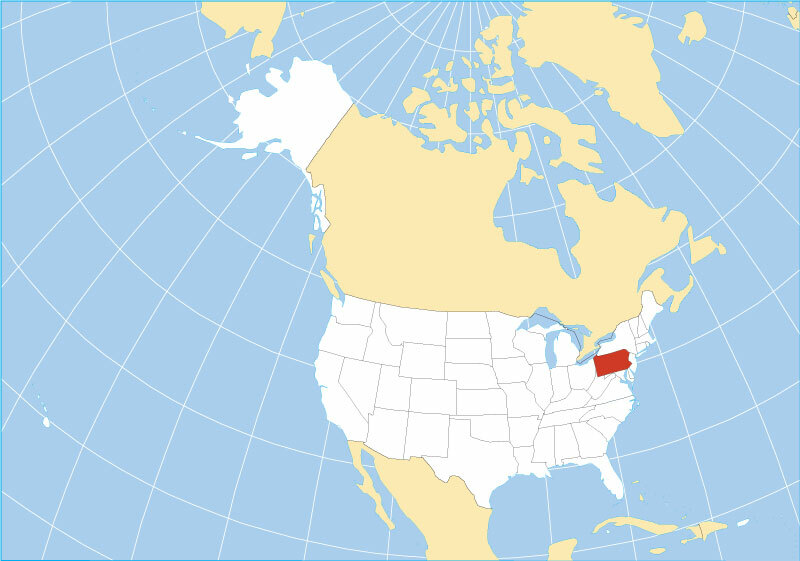 Compared with other US states, New Jersey would fit into Pennsylvania more than 5 times. However Texas is almost 6 times larger than the Quaker State (Pennsylvania's nickname). 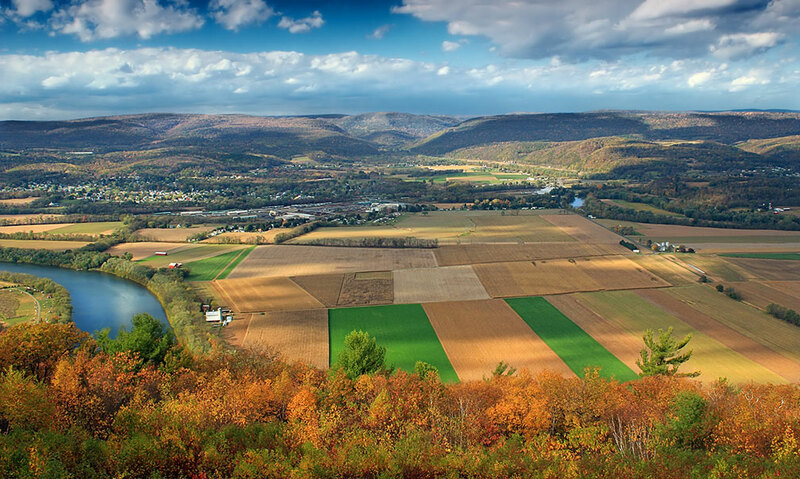 The Pennsylvania's landscape is dominated by the Appalachian Mountains, an eroded mountain chain in eastern North America. West Branch of the Susquehanna River Valley and the Allegheny Plateau foothills, view from Aughanbaugh Road on Bald Eagle Mountain. Located in the southeastern corner of the state, in the flat Atlantic Coastal Plain, sprawls the Philadelphia metropolitan area (Philadelphia-Camden-Wilmington MSA), with a population of more than 6 million people. The urban agglomeration is also sometimes referred to as the Delaware Valley. To the northwest of Philadelphia metro extends the plateau region of the Pennsylvania Piedmont, an agricultural region of rolling hills in the state's portion of the Piedmont Plateau occupy the south eastern part of the state. Making iron. Bethlehem Steel from the Fahy Bridge, Bethlehem Steel was a steel and shipbuilding company. Mountainous Northeastern Pennsylvania is home to the Pocono Mountains, the Endless Mountains and the former coal mining cities in the crescent-shaped Wyoming Valley (Anthracite Valley). A variety of landforms of the Appalachian Mountains dominate the central landscape of the Commonwealth. 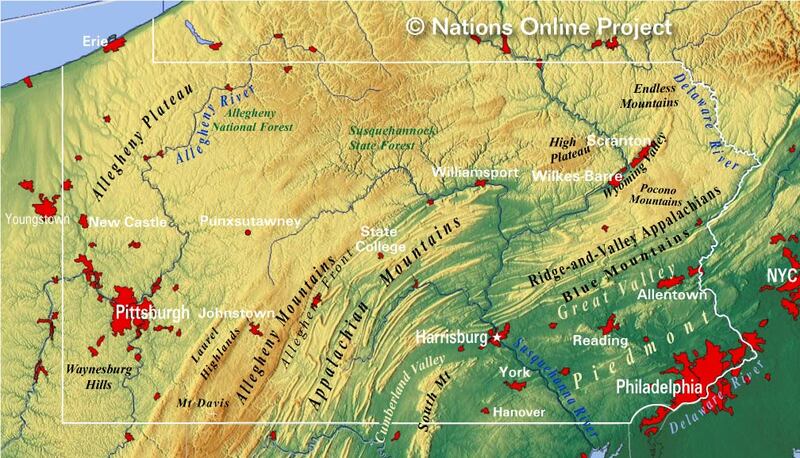 The north western portion of Pennsylvania is shaped by the large dissected Allegheny Plateau and the Allegheny Mountains in central Pennsylvania. The Lake Erie Plain in north west is a narrow region along Lake Erie. Mount Davis in the Forbes State Forest, at 979 m (3,213 ft), is the highest point in the Commonwealth. Major rivers in Pennsylvania. The Allegheny River joins with the Monongahela River to form the Ohio River in Downtown Pittsburgh. The Delaware River defines the eastern border of the Commonwealth with New York state and New Jersey. The Susquehanna River, one of the oldest existing river systems in the world, is formed from two main branches: the "North Branch", which rises in upstate New York, and the "West Branch", which rises in the Allegheny Mountains in western Pennsylvania. The Schuylkill River and its tributaries drain major parts of the center-southern and easternmost Coal Regions in the state before joining the Delaware River. Major lakes in Pennsylvania are the Allegheny Reservoir (also known as Kinzua Lake), a man-made lake along the Allegheny River. The Raystown Lake, a reservoir at the Raystown Branch of the Juniata River, is the largest lake that is entirely within the state. Pennsylvania has a shoreline at Lake Erie, the fourth-largest lake (by surface area) of the five Great Lakes in North America. 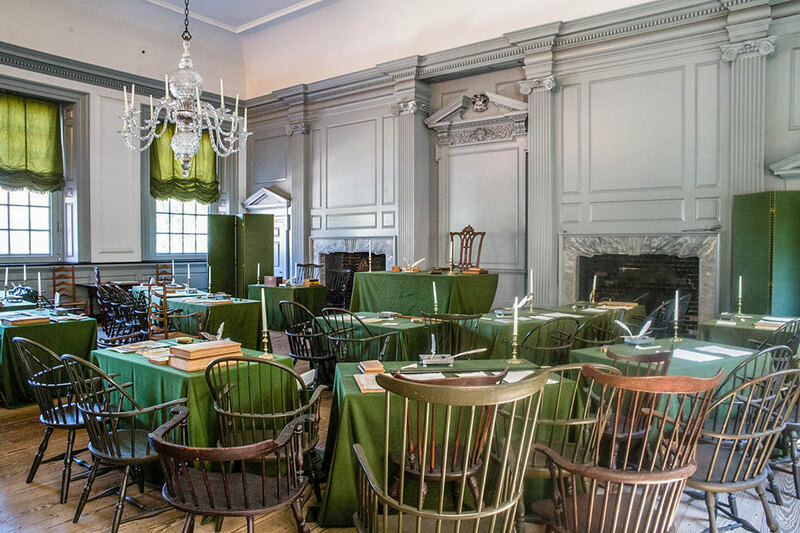 The Assembly Room in the Independence Hall in Philadelphia. The hall is arranged as it was during the Constitutional Convention and featuring George Washington’s Rising Sun Armchair. Pennsylvania has one UNESCO World Heritage Site. The Independence Hall in Philadelphia is the building where both, the United States Declaration of Independence (1776) and the Constitution of the United States (1787), were argued and adopted. The building was completed in 1753 as the colonial legislature for the Province of Pennsylvania and was used in that field of activity until the state capital moved to Lancaster in 1799. The universal principles of freedom and democracy set forth in these documents are of fundamental importance to American history and have also had a profound impact on law-makers around the world. 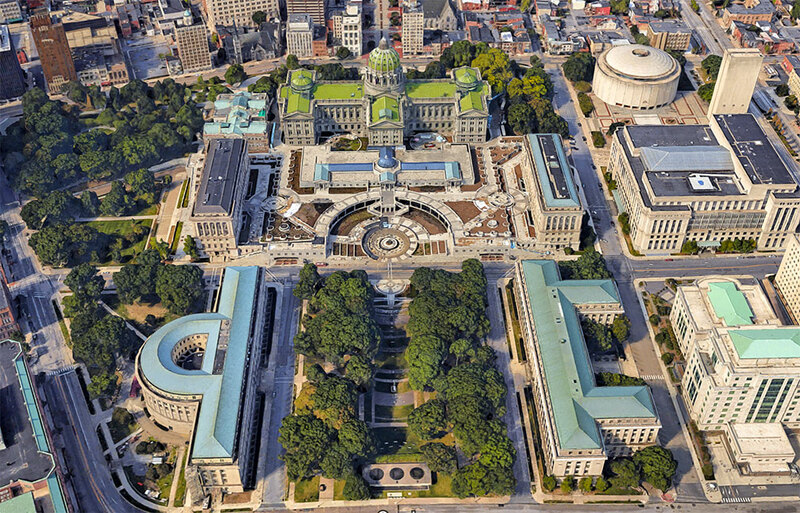 Rendered image of Pennsylvania State Capitol Complex in downtown Harrisburg. The Capitol building houses the government of Pennsylvania. 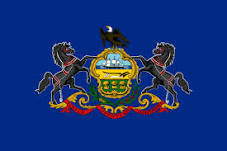 The Commonwealth of Pennsylvania (aka The Keystone State (Pennsylvania's other nickname)) has a population of more than 12.8 million people (2018 est.) , making it the 6th most populous US state. Capital city is Harrisburg, largest city is Philadelphia, largest metropolitan area is Greater Philadelphia (Delaware Valley Metropolitan Area). Other major cities are Pittsburgh, Allentown, and Erie. 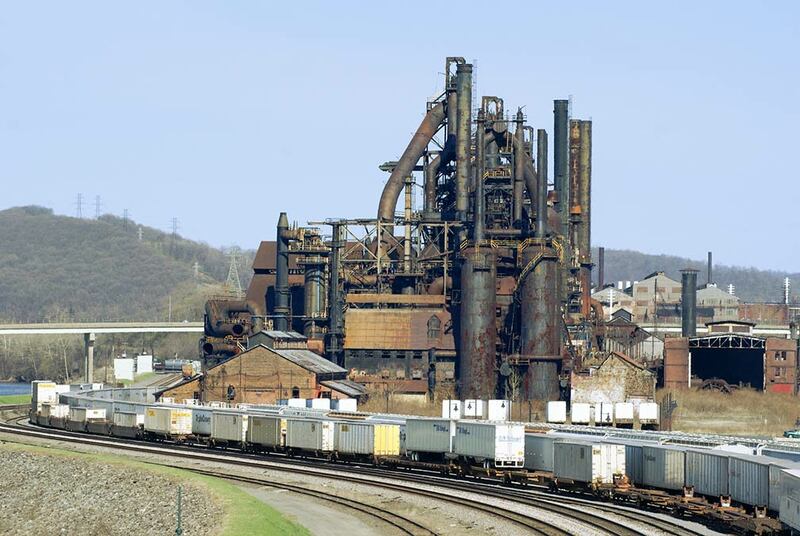 Philadelphia, Pittsburgh, Erie, Scranton-Wilkes-Barre, and Allentown-Bethlehem-Easton are the major urban manufacturing centers in the Commonwealth. Downtown Pittsburgh seen from the observation deck at the top station of the Duquesne Incline (inclined plane railroad). Aliquippa, Altoona, Beaver Falls, Bedford, Bellefonte, Berwick, Bethel Park, Bloomsburg, Bradford, Butler, Carbondale, Carlisle, Chambersburg, Chester, Clarion, Clearfield, Columbia, Connellsville, Corry, Coudersport, Doylestown, Du Bois, Easton, Edinboro, Emporium, Franklin, Gettysburg, Greensburg, Greenville, Grove City, Hanover, Hazleton, Honesdale, Huntingdon, Indiana, Jersey Shore, Johnstown, Kane, Kittanning, Lebanon, Levittown, Lewistown, Lock Haven, Mansfield, Meadville, Monroeville, Mt Lebanon, New Castle, New Kensington, Norristown, Oil City, Pittston, Pottstown, Pottsville, Punxsutawney, Sayre, Sharon, Shenandoah, Somerset, St Marys, State College, Stroudsburg, Sunbury, Titusville, Towanda, TyronendianaI, Uniontown, Warren, Washington, Waynesburg, Wellsboro, West Chester, Wilkes-Barre, Williamsport, and York. 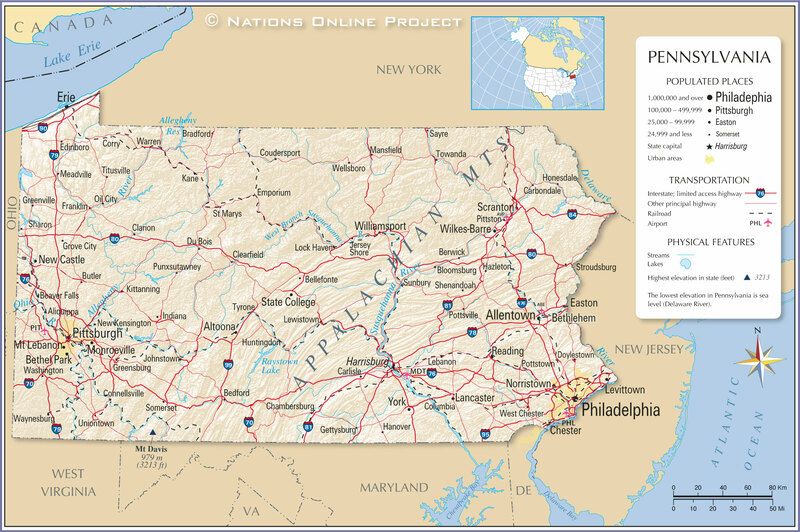 The detailed map below is showing the US state of Pennsylvania with boundaries, the location of the state capital Harrisburg, major cities and populated places, rivers and lakes, interstate highways, principal highways, and railroads.